An Israeli soldier walking away after handing a demolition order to Sister Adrianna of the Cremisan monastery. The separation fence could divide the nuns from the monks at the Cremisan monastery, giving new meaning to gender segregation. The monks and nuns of the Cremisan monastery, on a pastoral ridge opposite Har Gilo, have been living peacefully, side by side, since the place was built in late 19th century. But a new segment of the separation fence Israel is building will not only bisect the Cremisan's verdant terraces, but could also separate the inhabitants of this Salesian order, leaving the nuns on the West Bank side of the barrier, and the monks on the Israeli side. That, at least, is the solution the Defense Ministry recently proposed to the members of the Catholic monastery. The fence hasn't physically split the men from the women yet, but it has already caused a rift between them. The Cremisan is located on the slopes of Walaja, a Palestinian village, that will eventually be surrounded by the separation fence. The monastery, which straddles the West Bank and Jerusalem, was originally slated to be entirely on the Israeli side once the fence is completed in September, according to the Defense Ministry. For the monks, who earn their livelihood producing and selling wine, mainly in Israel, that's good news. But for the nuns who operate a Catholic school for Palestinian children from nearby West Bank villages, it's bad news. The fence will prevent their pupils from reaching their school, or at the very least, make it difficult for them to do so. IDF soldier handing a demolition order to Sister Adrianna of the Cremisan monastery south of Jerusalem. Sister Adrianna of the Cremisan monastery south of Jerusalem. Since 2006, when the monastery was informed of the impending construction of the fence around Walaja, there has been tension between the men and women of the monastery. "The monks make wine, and for them it's great. They're interested in producing wine and this enables them to send it to Israel, where their customers are located," said the Mother Superior, Sister Adriana, this week. "For us it's not good at all. If the fence passes here and they put us on the Israeli side, the children won't be able to reach us. There's only one road to the monastery. The fence will create a checkpoint here with soldiers." Sister Adriana would prefer not to have a fence built at all. This may be the only point about which the nuns and monks agree. 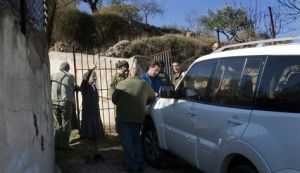 About a month ago, in an attempt to calm things down, the administration of the monastery published a guarded condemnation of the fence, presenting the monks' view: "The monastery never asked to move over to the Israeli side," it said. 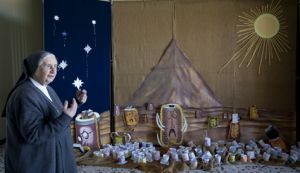 "The entire route of the fence, including the part that directly affects the lands of Cremisan, was decided by the Israeli authorities alone." But the announcement did not impress Sister Adriana. "We and the monks have very different opinions regarding the fence here," she said, adding that she preferred not to elaborate. The difference in the actions of the monks and nuns also attests to the dispute regarding the route of the fence. Aside from publishing the condemnation, the monks took no action to stop the construction of the barrier. On the other hand, the nuns turned repeatedly to the Latin Patriarch in Israel to request his help in their struggle. Then, in March 2010, they turned to an Israeli court to ask that the monastery remain under West Bank jurisdiction. With the help of the Catholic human rights center Saint Ives, they asked to join the petition of the residents of Walaja, who challenged the fence, which will surround their village. The residents lost their petition to the High Court of Justice in August. But the nuns of the Cremisan are still contesting the exact route of the fence. "The petition itself is still under deliberation," explained attorney Manal Hassan Abusini, who represents the nuns in the case. In response to the nuns' protests over the last four years, the Defense Ministry has proposed various solutions. In the latest proposal, Abusini says that the ministry suggested having the separation fence run through the monastery in such a way that the nuns would remain in the West Bank, while the monks would be in Israel. But the nuns oppose that proposal. It's not the physical separation from the monks that is the problem. They say the proposed route will cause serious damage to the land of the Salesian order, some of which is used by them and their students. Sister Adriana and the other nuns in the order were planning to submit their declaration of opposition to the proposal, which was to be discussed in the Tel Aviv Magistrate's Court this week. Meanwhile, the school was empty during the week because of the Christmas vacation. Ordinarily, there are almost 300 children aged 4-16 in the complex. They easily fill the paved square that stretches opposite the large stone building that houses spanking clean classrooms. Most of the children come from Walaja. "Our only work is educating the children," says Sister Adriana. "When they come here we have to heal their hearts too." Sister Adriana and the other nuns tried to broadcast business as usual as they prepared to welcome the students back to school in a few days. But a cloud was hanging over the monastery. Sister Adriana sat in a nicely furnished room, calmly explaining her world view. A minute later, she found herself outside the monastery fence conducting a lively debate with a group of soldiers and a Defense Ministry contractor who were examining the site - a preliminary stage before building the fence. At the end of a short discussion the contractor handed her a demolition order for two old buildings in the courtyard of the monastery, where the fence is supposed to pass. "We are against this dispute," she said, alluding to the rift with the monks. "Here we say: 'Walls do not make good neighbors.'" The monks' administration at the Cremisan monastery preferred not to respond.